For use with those using Harcourt Storytown for Kindergarten. 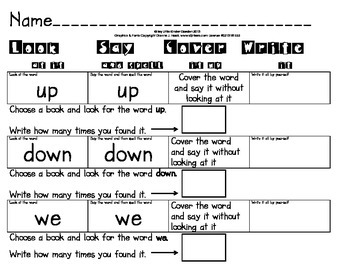 hfw are: up, down, we, want, out, who, what, are, they,she. Run these pages at the conclusion of each theme, or back to back at the end of Unit 4 . This is for use in the classroom or as homework. In addition, children are asked to choose a book and look for the specified word and then record the number of times the word was found. Look for additional Harcourt Storytown Kindergarten files we have developed as well!